Madagascar has a rapidly growing population that is set to increase from 24.2 million in 2015 to 36 million by 2030, according to UN figures. Population growth presents an economic potential, but could also be a challenge for the country. 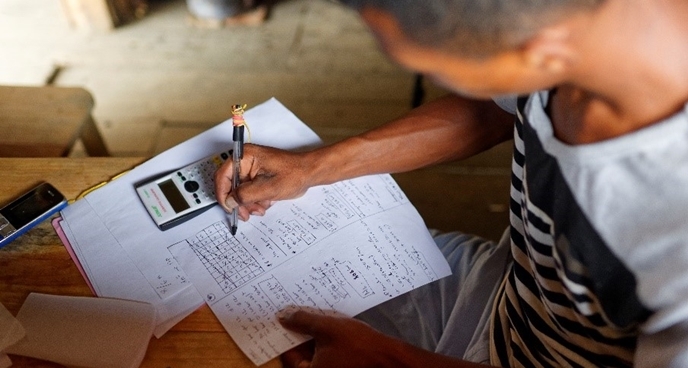 Madagascar’s young population puts a pressure on education and training systems to provide quality education for all. Another challenge the nation faces, like many other low-income countries, is a precarious labour market, with 86% of employees holding precarious jobs in 2012. To help tackle these challenges, UNESCO’s Capacity Development for Education (CapED) Programme has been active in Madagascar since 2010. The Programme supports the country develop vocational training for out-of-school rural youth, providing opportunities for quality, relevant and sustainable education in areas of economic opportunity. Since 2014, 2,500 youth have been trained, some of whom have used the training to set up their own businesses and as a result, become financially independent. After the training, each learner receives a starter kit with either seeds, cooking equipment or other materials depending on their area of study, to help them start their own enterprises. The subjects taught at the learning centres include masonry, carpentry, pig farming, sewing, mechanical engineering and wickerwork. As well as providing youth with opportunities to learn skills to pursue vocations, the initiative is not gender biased, allowing women to have access to careers that are traditionally occupied by men. In addition, one of the programme’s knock on effects is to help retain young workers in rural areas, as providing them with the skills they need to secure local jobs or start their own businesses, gives them another option that migrating to cities for work. 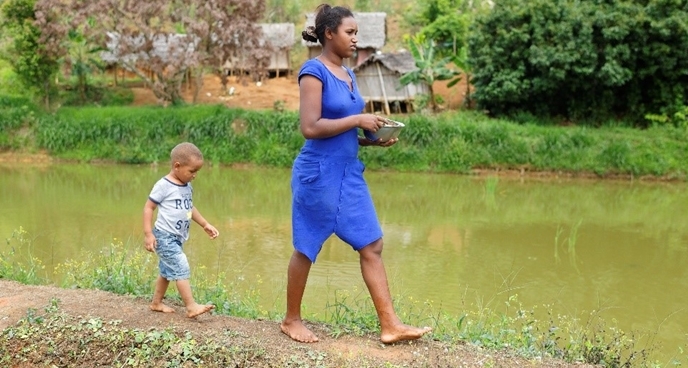 Natacha Obienne with her son maintaining her fish ponds. 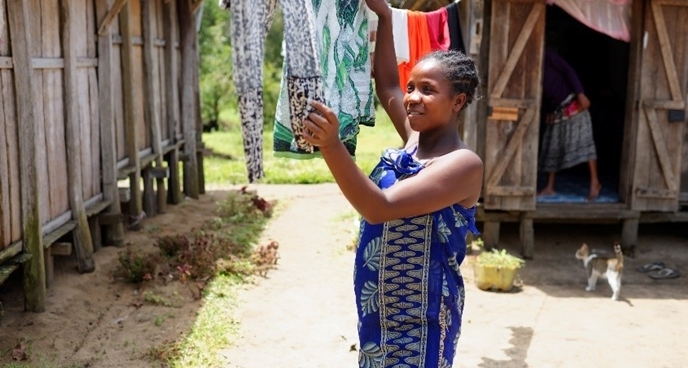 “I no longer depend on my parents, I am financially independent,” says 21-year-old Natacha Obienne, who lives with her husband and child. During her vocational training, she learned to breed fish and to manage their conditions for optimised production. Before the training, Natacha did not know anything about fish farming. She is now planning to construct a second fishpond, and she has been able to buy a house and a cow. “I advise young people like me to pursue training because I learnt everything from a training course,” she says. 22-year-old Jean Thierry, who now owns a successful construction business, says that he was completely new to the construction industry before he received his training. As well as learning construction skills, he acquired motivational, entrepreneurial and managerial techniques. One of the skills he mastered was how to dose concrete. Jean now recruits other workers and youths, and passes on his knowledge. He has been financially independent for two years now and hopes to secure larger contracts in the near future. “My future is assured if I continue to progress as I am now,” he says. Emma Claudia hangs washing clothes near her home. Following the success of CapED’s vocational training programme, the President of Madagascar called for the country’s first ever National Employment and Vocational Training Policy, which aims to increase job opportunities. This policy was legally adopted in 2015 with the support of CapED.